Konishi Garnet Rouge is a red ale brewed by Konishi Brewing out of Hyogo. Whilst most rice beers are brewed using white rice, Konishi Garnet Rouge, along with Hitachino Red Rice ale are two exceptions. This beer is brewed using black rice which is not usually a popular grain in Japan. Named after jewellery, this could take off as a new engagement beer. I think now. Konishi Garnet Rouge pours out a deep red colour with a slight cloudiness to it. There was some sediment at the bottom of the glass, and a thin white head at the top. The head lasted no longer than minute leaving just the red body. Konishi Garnet Rouge is listed as having the aromas of pomegranate and figs but it’s hard to notice them. I admit it was fruity, but unless someone had a plate of pomegranates and figs nearby, I would be hard pressed to say this beer had their aroma. Konishi Garnet Rouge is slightly carbonated, not full of bubbles nor flat as a pancake. It is definitely more towards the sweet end of beers. Saying that, there was a subtle spicey edge to it that made me think it was more a Belgian red ale. The aftertaste of the beer was dry and bitter. 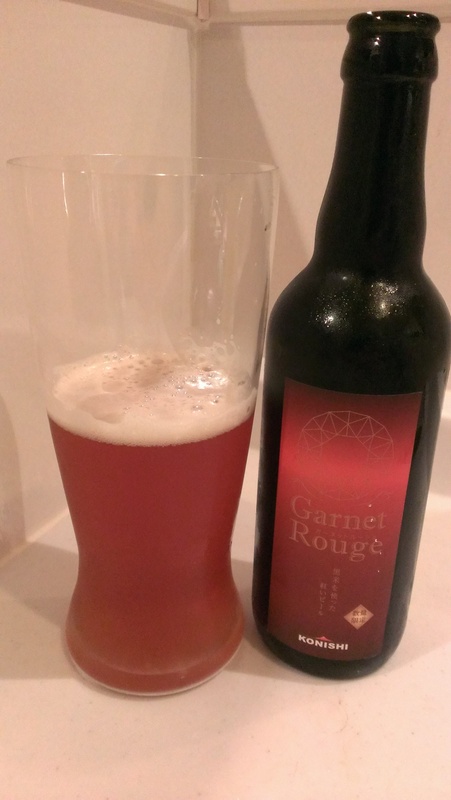 Konishi Garnet Rouge is an interesting and enjoyable beer worth trying if you come across it. Konishi Garnet Rouge can be bought on the Konishi Brewing online store here but at the time of writing ¥540 plus tax is a little on the pricey side. If you can find it cheaper, then let us know below in the comments.